Essential for wintertime dry, cracked hands. A favorite for the teen girls in our family (and their Moms if they ever have time for a relaxing bath!). Back to the dry, wintertime hands... I'd like to add a small bottle of lotion by my kitchen sink but definitely don't want a plain old lotion bottle sitting out. How cute is this refillable striped dispenser to add a bit of happy to the kitchen? I received a pair of these at a Favorite Things party last year, and since then I've bought about 10 pairs. I love them in the winter! They are super soft, and cozy but not thick. I especially love wearing them with my Uggs and other boots. I got one of these several years ago, it's a storage game changer! The scarf-wearer in your life will love it! These reusable bags are such a novel idea. I think they're great especially for kids or teens to pop an after school snack in the toaster and have a quick, easy toasted sandwich. Teenage boys? In our family food is always on their list, and generally they specifically request beef jerky! On my husband's list for washing cars and chores around the house, it's always nice to have a fresh round of microfiber cloths. Another favorite to tuck in the guys' stockings! I've shared a similar brand recently when I told you My Five Favorite Beauty Products, but I've also heard great things about this one and am looking forward to trying it out too. I always love to try new things like this when they're slipped in my stocking. My favorite colored pens for calendaring, writing notes, etc. My girl loves them too and needs her own set! 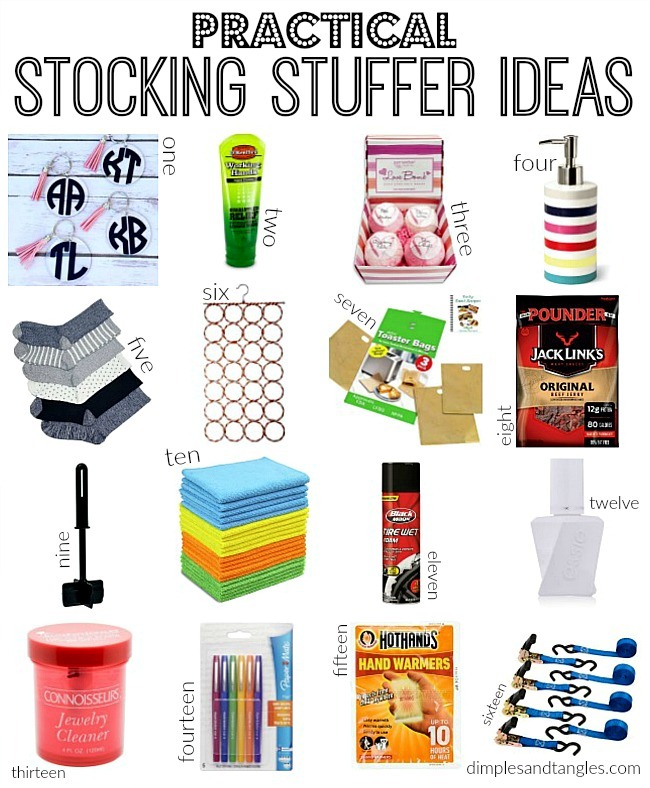 What are your favorite practical stocking stuffers to give and receive? I love 1,3,5 & 14 the most! I love to put eye glass cleaning cloths,sticky notes and car air freshners, small pack kleenex tissues and my favorite is the two pair of knit gloves for 1.50(last year at Walmart) and for each family member to have in the dash of there car with ice scraper close by. I so much enjoy your blog. Hot Hands are also great to keep in your car console to give to people on street corners on cold days. It breaks my heart to see people out in the cold!